I've spent most of the build up to this race tempering my hopes of a good race weekend, as the Hungaroring has often failed to deliver in the past. 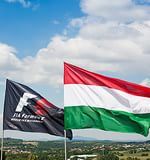 I can't influence whether you enjoyed the racing action this weekend, but I'm definitely sure that it delivered something we rarely see in Hungary, and something that will likely tide us over the summer break drought of F1 racing. Now's your chance to show where you think the race stacks up on the 2014 roster. Whether the racing was good or not is what you're here to decide, but it can't be argued that it wasn't packed with incidents. From a pre-race shower that left tyre calls tricky, to crashes that brought out the safety car and crashes whilst the safety car was out, to a three-way fight to the chequered flag, there was a little bit of everything in the final race before the summer break. Rate the action now, with five stars being a fantastic F1 performance and one star as a disappointment. As full as the racing was of incident and excitement, there were few things that called for a specific poll. Instead, here are two items on the outskirts of the race weekend - Bernie's continued efforts to meddle in the sport, and Ferrari's new boss wearing his heart on his sleeve. This weekend, it emerged Bernie Ecclestone wants a working group, with input from Flavio Briatore, to get together to improve the appeal of Formula One to the masses. Following that news, the Hungarian Grand Prix, a race usually one of the more disappointing on the calendar, turned out to be stacked full of chaos, providing a great afternoon of entertainment. Rate the need for improving the show, with five stars a good idea to work on the problem and one star being no problem to fix. The new Ferrari team principal was left somewhat red-faced, after a disappointing qualifying put him in a bad mood and he blanked the waiting TV broadcasters. With a harsh "no comment" to SkyF1, Mattiacci later apologised for his brusque attitude and went on to get ever so slightly emotional about Alonso's rise to a podium finish. Has the Italian got himself a little too involved (one star), or is it good to see him wearing his heart on his sleeve (five stars)? Finally, it's time to decide the driver of the day. This feels like it might be a very tricky call. Lewis Hamilton's meteoric rise through the field deserves credit, but Fernando Alonso hauled that Ferrari were no one else would be able to. And race winner Daniel Ricciardo scooped a second victory from a season that has Mercedes written all over it. Cast your vote now! Who was your driver of the day in Hungary? As always, feel free to choose your selections in private, but if you're feeling more sociable about it, let us know who you've chosen and why. There are handy share buttons if you want to get all Twitter about it, but equally let us know in the comments and see if anyone else thought the same.